Over the past few days, you may have seen what appears to be a makeshift shelter outside the campus bus loop. The project is known as ‘In a Box’. It started 11 years ago as an initiative by the Tau Kappa Epsilon (TKE) fraternity at Ontario Tech and Durham College to raise awareness about homelessness. Students from the fraternity started living in their makeshift shelter on Monday at midnight and plan to stay for 72 hours. Members of the fraternity take shifts in pairs in ‘the box’ trying to raise awareness about homelessness in Durham Region, as well as food and housing insecurity for students. TKE president Ryley Gemmill, a third year Public Health student at Ontario Tech, said the project is part of its outreach projects for the campus community. “We do a lot of other outreach with other charities, but we didn’t really do anything on campus,” said Gemmill. 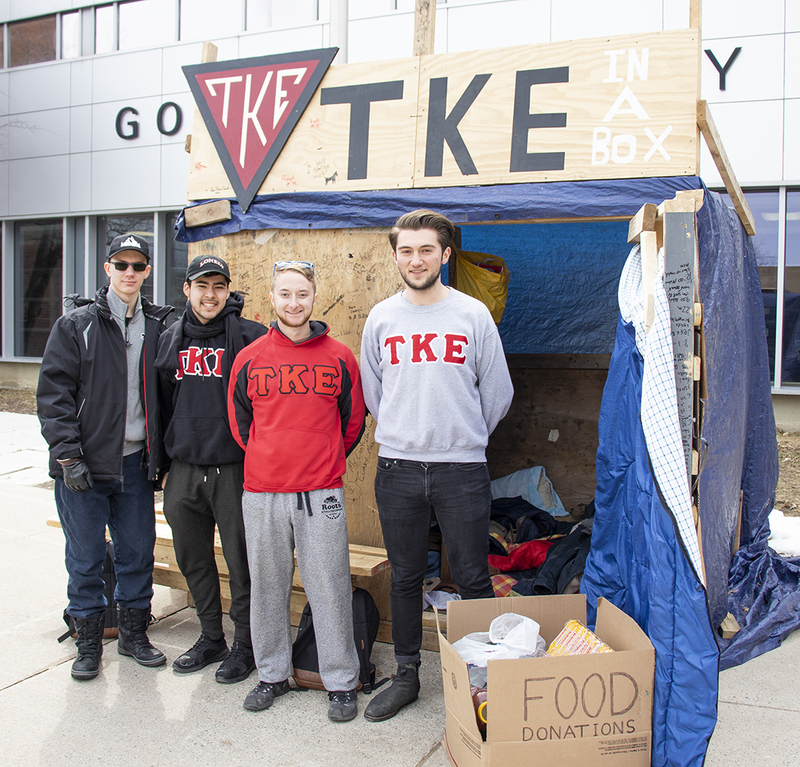 When TKE realized the campus had a food bank for students they thought it would be a creative idea to build a shelter, simulating what it would be like to be homeless and unaware of when your next meal would come or where you would sleep. “It’s the end of the year, students might not have signed a lease for next year. So, they’re going into exams worried about where they’re going to get their next meal and where they are going to be living in a few weeks,” said Gemmill. TKE is trying to combat this stressful time of year for students by taking food and cash donations for the Campus Food Centre. TKE’s main goal for its project is to raise awareness because it is an invisible issue, said Gemmill. He believes drawing attention to the cause will help reduce the stigma around asking for assistance. TKE hopes to raise $500 in cash and food donations this year for the Campus Food Centre. “It is definitely good to see a result. I know people that have had to use the food centre,” said Gemmill. The fraternity also donates its time to Feed the Need Durham. One in 12 households in Durham Region is food insecure, according to Durham Health. TKE will be at ‘In a Box’ outside the Gordon Willey Building taking donations until 5 p.m. today.